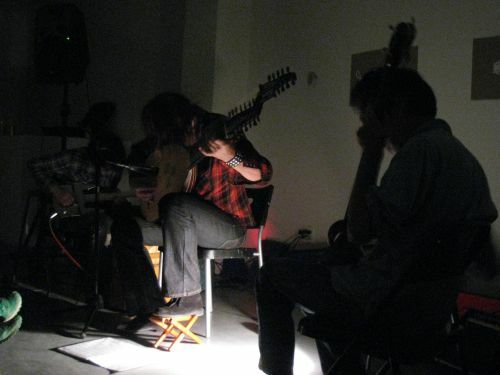 Lute player Josef van Wissem stopped in Minneapolis April 20 for a couple of sets at Art of This, a small gallery space hosting an improvised music series on alternate Tuesday nights. Though van Wissem bore an unnerving resemblance to Javier Bardem in No Country For Old Men, my conversation with him was warm and humorous. We talked primarily about his collaborations with a favorite guitarist of mine, Tetuzi Akiyama, and a very funny anecdote about lute player Eugene Dombois [who, along with Julian Bream, served as my portal during my college days into the world of the Baroque lute]. van Wissem offered a sweet solo set, beginning with a piece apparently still in process, as the sheet music lay at his feet. There were several extraordinary rests in the piece [ perhaps 20-30 seconds? ], in which I initially thought he had stopped playing in response to the ubiquitous audience noise. 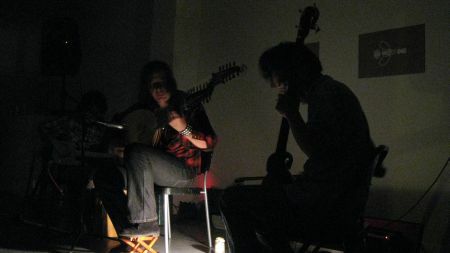 In fact, the silences rested between iterations of evocative melodies sounding at once very old and intimately familiar. Nice. He concluded his solo set with a piece played while standing close to the listeners, assuming a wide, Neil Young-like shredding stance, rocking back and forth. Somehow this seemed unaffected and oddly touching, the swan neck lute essaying simple, stately melodies the while. The closing set was a trio improvisation with van Wissem and his touring associates [ the trio’s moniker is Heresy of the Free Spirit, sort of Incredible String Band-ish] from Brooklyn, Che Chen and Robbie Lee, the latter two moving through a battery of wind, string and reed instruments. A nice closer, with moments of water-treading, but a cogent concluding drone work. The photos are courtesy Jesse Peterson, a Minneapolis-based guitarist you can check out here. This entry was posted in music writing on April 27, 2010 by jessewgoin. What was the anecdote about Dombois? I am fascinated by his playing, so any glimpse into the human side of him is great to know. Probably best I am the soul of discretion. Dombois' records remain in my collection and occasionally I remember to revisit them.